Vic Corbi started Grilled Cheese & Co. with such humble fare as sandwiches and fries, sold out of food trucks and tents at local festivals. Photo by Kitty Ramona. Vic Corbi says his business began with a dream. One night in the summer of 2005, he dreamt that he was selling grilled cheese sandwiches out of the back of a trailer. It was, to say the least, a most unusual and quite specific dream. So specific, in fact, that it has come true, and more. In 2009, after years of planning, Mr. Corbi and his childhood friend and fellow Carroll Countian, Matthew Lancelotta, co-founded Grilled Cheese & Co., originally serving their fare out of food trucks and in tents at local festivals like Columbia’s Wine in the Woods. “It was a low-cost entry into the food business,” said Corbi, 37, a husband and father who lives in Westminster and has had extensive experience working in his family’s food distribution business. 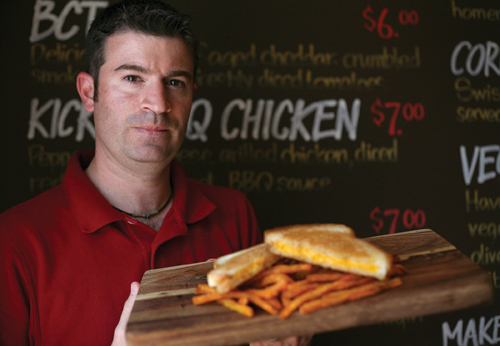 Although the company still participates in a half-dozen festivals yearly, Grilled Cheese opened its first restaurant in 2010, a 1,100 square-foot space at 500 Edmondson Avenue, in Catonsville. The partners chose the site for a couple of reasons: The building, a former bakery, is well known in the area, and Lancelotta has a lot of family thereabouts. Lancelotta, 35, a husband and father who lives in Ellicott City, is a real estate agent with Re/Max. He calls himself “more of an investor” in the company, leaving the day-to-day operation to Corbi. James Lancelotta, his brother and an experienced chef, subsequently came on board as executive chef. The three men are partners in Grilled Cheese. The Catonsville restaurant and a second eatery in Eldersburg opened this year. The latter, a 1,350 square-foot space in a small strip mall at 577 Johnsville Road, is “fast-casual,” which has become the fastest-growing segment of the restaurant industry. In the industry, fast-casual falls between a fast-food place and a sit-down restaurant with wait staff. At Grilled Cheese, you place your order at the kitchen counter, take a number and have your food brought to you at whatever table you choose. Both Grilled Cheese restaurants are open seven days a week, 11 a.m. to 9 p.m., for lunch and dinner. Each employs 25 to 30 full and part-time workers. The two Grilled Cheese restaurants, in Catonsville and Eldersburg, serve a total of about 300 sandwiches a day, and, along with a kiosk that opened this year at Baltimore’s Ravens’ Stadium, gross almost $2 million per year, according to Corbi. Comfort food is an emerging trend in restaurants, purportedly starting in California. That was not the case when Grilled Cheese opened. The premise for the restaurant harkens to Corbi’s childhood when, as a self-described “picky eater,” he limited his diet to five or six items. Grilled cheese was one of them. Corbi created the original menu, basing the recipes on his food distribution experience and research. But “you can’t offer just grilled cheese,” he realized, so he was careful to offer other options as well. The Eldersburg restaurant features 11 different grilled cheese-themed sandwiches, from $5 to $8, along with soups (“a natural with grilled cheese”), salads, side dishes and a dessert item. Corbi also attracts customers with a weekly “special” sandwich and an “underground” menu, which has additional sandwich selections on the web site (www.ilovegrilledcheese.com). The most popular sandwich is the Crabby Melt, at $7.49, cheese and homemade crab dip, accounting for more than 20 percent of the revenue; the most expensive is the Fresco, at $7.99, two cheese, roasted pepper, pesto and balsamic glaze, and the most exotic is the-Sweetest Thing, at $6.99, two cheeses, raspberry preserve and chocolate chips. The Catonsville restaurant opened in April, a date deliberately chosen because it is, according to research, National Grilled Cheese Month. Corbi boosted the event with phone calls to Grilled Cheese’s fans from the festivals and to the media, and used social networks like Facebook and Twitter to “create a buzz,” he said. He succeeded beyond his wildest dreams. “We were mobbed on opening day,” he said. Lancelotta was surprised, too. Lines of sandwich-seekers stretched out the door. “I thought we’d be popular but I didn’t expect that,” he said. The appearance of a crew from WMAR-TV Channel 2 to record the scene did not hurt, nor did a report two days after the opening by WBAL-TV Channel 11. The partners have ambitious plans for the future. This summer, they are opening two more Baltimore restaurants in Federal Hill and Padonia Village. More kiosks are also on the way, including one due to open this summer at Harborplace in Baltimore City. In the end, they hope to have a dozen or so Grilled Cheese restaurants in Maryland, all of which will be company-owned. In late 2011 or early 2012, they expect to move to the next phase of their business plan when they begin franchising Grilled Cheese. They are hoping to expand into neighboring states, said Corbi, who envisions 30 franchised restaurants in the mid-Atlantic region within the next two years. The firm is not all about sandwiches. Grilled Cheese & Co is involved in community events. Non-profits can book a day at the restaurant and receive up to 25 percent of the day’s gross sales revenue. In cooperation with the local schools, students get certificates for earning good grades. Stale bread is donated to My Brother’s Keeper, a charity-based soup kitchen.